Could a Boiler Work for Your Home? It pretty much goes without saying that it gets pretty cold here in our area! As a result, frozen pipes are certainly a threat. While we don’t have to worry about them quite yet, the time to prepare for them and avoid this problem in the winter is now. Frozen pipes lead to other issues, such as burst pipes and subsequent damage, which we assume you’d like to avoid! And remember, if you run into this problem in the coming months, or any other type of plumbing emergency, you should call a professional plumber in Union, NJ, versus trying to fix it on your own or hiring a general handyman. The plumbers on our team have extensive experience and you can rest assured that when we are on the job, the job will be done right! So, what exactly can you do to prevent this problem? Read on! Pipes typically freeze during longer periods of freezing temperatures (anything below 30°F). In our area, this is typically near the end of winter that this occurs. 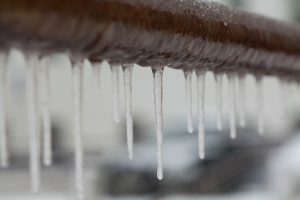 But we all know how the weather can surprise us, so when temperatures begin to plummet, make sure you’re vigilant and paying attention to the state of your pipes. As soon as the weather drops to the point that you’re no longer using your outdoor faucets and hoses for the season, it’s time to drain any outdoor water lines. This includes the lines leading to your outdoor sprinklers as well as your swimming pool. We’re happy to help with this, but it’s actually a lot easier than you might think, and it’s a great preventive measure. You can buy insulating sleeves at just about any hardware store, and apply them to any pipes that lead outdoors—such as behind walls, your crawlspace, or your basement. On the topic of insulation, proper insulation in the home to begin with helps! Now is a great time to make sure you’ve properly insulated your home and take note of any unusual drafts coming from doors or windows (and use weatherstripping to fix that issue). We’re talking about the cabinets under your sink—the ones that house plumbing. This part of your plumbing typically leads outdoors and doesn’t stay as warm as the rest of your home, hidden behind cabinet doors. But leaving those cabinet doors open allows warm air from your heater to reach them. What if you have a sink or plumbing appliance that’s not quite outdoors but you still need to use in the winter? For instance, many homeowners have sinks in their garages. If this is the case, then keep an eye on that weather forecast as we mentioned above, and when we’re expecting frozen temperatures, keep a small trickle of water going. This is going to increase your water bill a bit—however, when compared to the costs of fixing a frozen or burst pipe, it might be worth it. Max Sr & Paul Schoenwalder Plumbing, Heating and Air Conditioning, A Corp. has been reliably serving customers for over a century. Contact us today for professional and reliable plumbing services and more!